Muktidham temple Nashik is one of the most visited religious tourist place located in an ancient city Nashik. It is located from 8 km’s away from the center of the city. This beautiful temple is well-known for an exact copy of twelve Jyotirlingas in India. 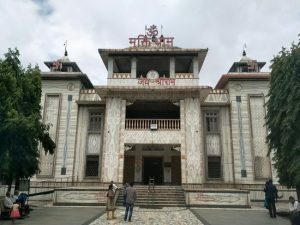 This temple was constructed in the year 1971 by Nashik’s well-known industrialist Late. Shri Jairambhai Bytco(Chauhan). paintings have been painted by painter Late. Shri Raghubir Mulgaonkar. This beautiful temple is made of white marble. The marble used in the temple was brought from the Makrana situated in Rajasthan, India. Construction work was done by sculptors came from Rajasthan. The 18 chapters of Holy Bhagawadgeeta is written on the walls of this temple. Apart from the twelve Jyotirlingas facsimile, temples of Hindu God’s like Lord Rama Laxman, Lord Shri Krishna, Vishnu, Lord Ganesha, Hanuman, Goddess Seeta was also constructed in the Muktidham temple campus. Temple remains open during 6 am to 7 pm. Tourist can also visit this place on public holidays. Best time to visit Muktidham temple is from October-March. Approx. 1.5-2 hours required to visit this place. There is Dharamshala constructed in the temple campus for tourist accommodation at very reasonable price. Dharamshala room charges start from Rs.250/-. Muktidham Dharamshala contact number is +91-9820098200. By Road: If you are coming from Mumbai then from Dwarka circle you have to take right towards Nashik Road railway station. After traveling for 6 km’s you will reach Bytco point circle. From there you need to take right and travel for 100 meters. If you are coming from Pune then just come straight at Bytco point and then take left and travel for 100 meters. By Train: Tourist which are coming by train need to walk for 10 minutes from Nashik Road Railway station. Thay can also hire auto rickshaw which cost them Rs. 10 per person. Tourist can also use city bus transport which is going towards Panchavati, it will cost Rs. 5 per person. By Air: Tourist which are coming by air need to travel for 20-25 minutes and need to reach Nashik Road by public or private transport. Kapaleshwar Shiva Temple – This holy temple of Lord Shiva is present at the bank of Godavari river. This is only Shiva temple which is without Nandi. This temple is at the distance of 8-9 km’s from Muktidham. Botanical Garden – This is another beautiful place to spend some quality time with the family and children. This spectacular garden is at the distance of 11-12 from the Muktidham temple.